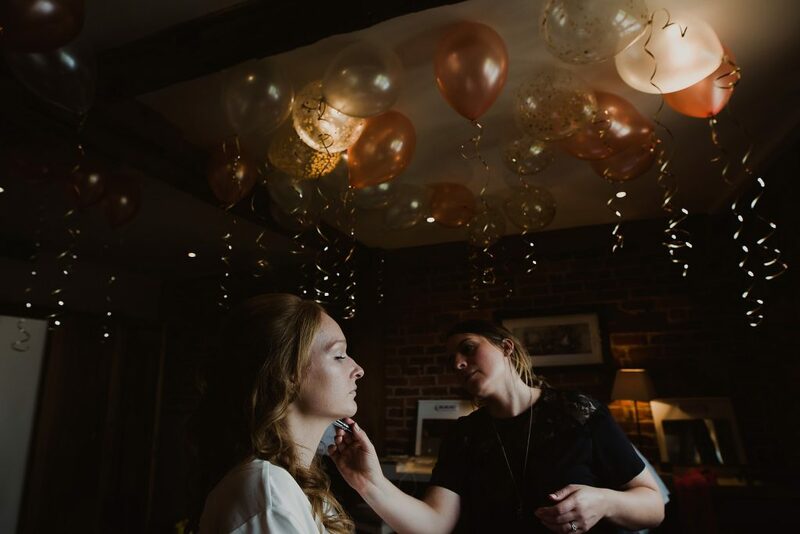 Wedding makeup at the Curradine Barns, Worcester is always a joy. So you can imagine how happy I was to be invited along to do Sara’s wedding makeup. You see, many moons ago myself and a couple of her bridal party were workmates in our waitressing days! Haha. So I knew that this wedding makeup was going to be an absolute blast. 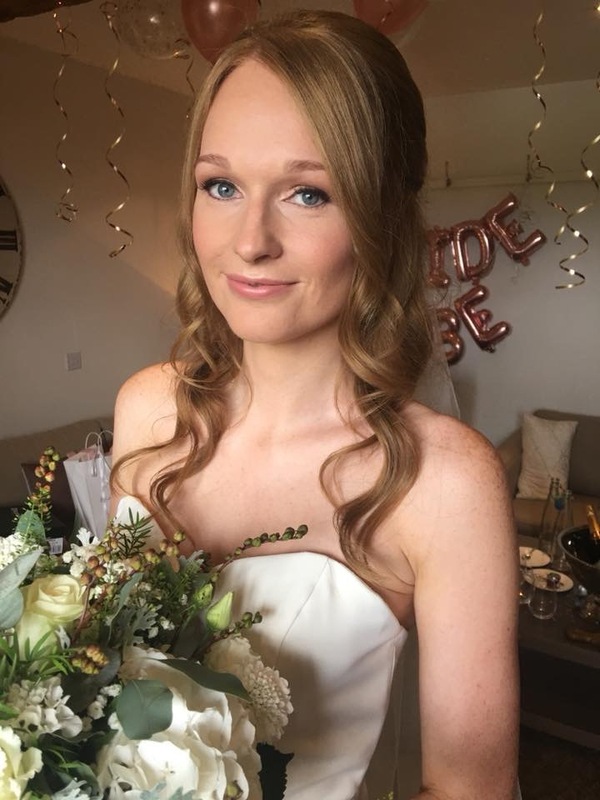 Wedding makeup at the Curradine Barns is always kind of special too! The atmosphere is just right, the prep room is full of beautiful light, and the venue and its staff are so lovely. But it’s even more special when you’re past acquaintances and old friends with the bridal party. 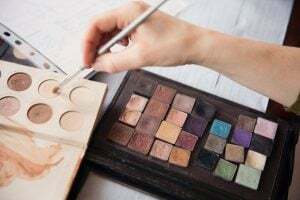 It makes doing their wedding makeup even more of an honour. But what I loved most about these guys is that they knew exactly how they wanted their makeup to be. And I loved that they weren’t backwards in coming forwards either! 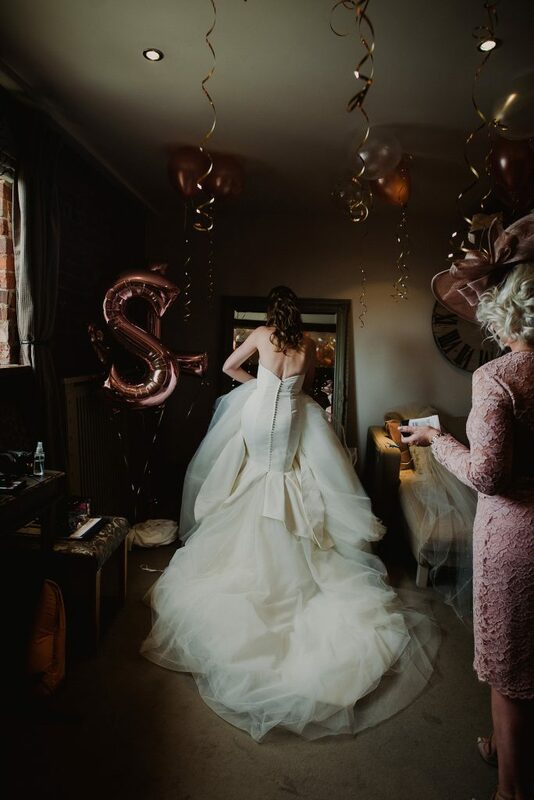 Sara’s bridesmaids had filled the room with rose gold balloons and streamers. Jade, Nomie and Emma were amazing bridesmaids. They’d decorated the prep room for Sara with rose gold balloons and gold streamers, there were copious bottles of champagne on the go. And they were all complimented with the Curradine Barns speciality; ‘that’ brownie and their pastry and fruit laden breakfast banquet. God help me this summer. I live for a square of that brownie. It really was a morning to behold. Sara had hired quite the team! So it was also great to be working with some of the best wedding suppliers in the industry. Wedding Photographer Amy Taylor was there to take all of the best shots of the bridal prep, and Georgina Scott Bridal had sent Tracie over to help get bride Sara into her beautiful Justin Alexander wedding gown. Tracie from Georgina Scott is under there somewhere, honest! 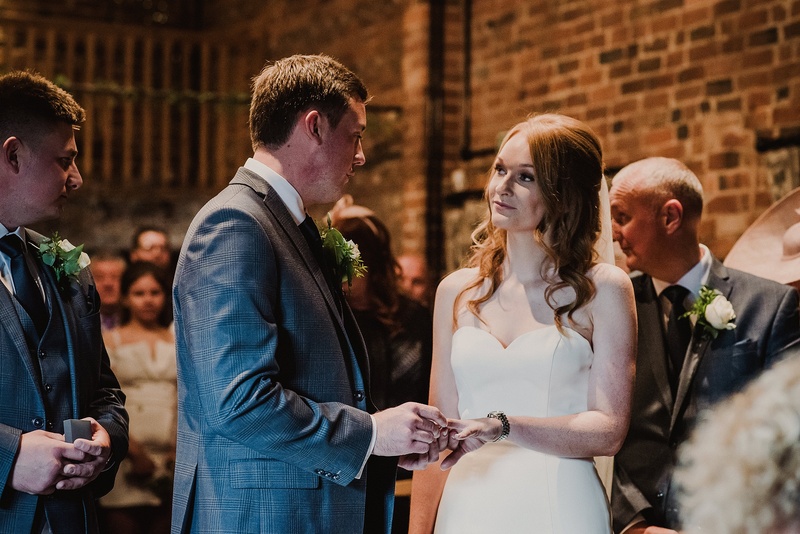 But what wedding makeup had Sara chosen to wear for her fabulous Curradine Barns wedding? Sara wanted to keep her wedding makeup light. She wanted a glow base, with a soft light pink lip and a lemony- gold eye. We kept the liner minimal and close to lash line, because this is what she was used to. It also enhanced her beautiful blue eyes. This brief worked perfectly against her gorgeous neutral blooms. Hairdresser Kelly Ashfield did an amazing job on the girls’ hair; especially creating a half-up, half-down sophisticated and neat ‘do’ for Sara herself. Bride Sara with her finished wedding makeup- quick pic by me! 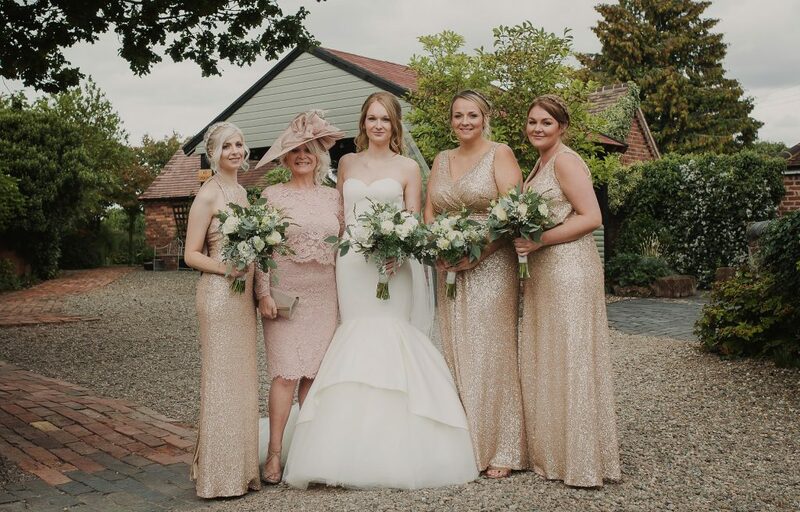 We opted for a warmer palette for her bridesmaids as they were wearing rose gold sequinned dresses. While all three were totally different in looks, we united them through the use of liner and a similar lip. It’s always a juggling act to make bridesmaids makeup personal, but also uniform. But I think we achieved it here! 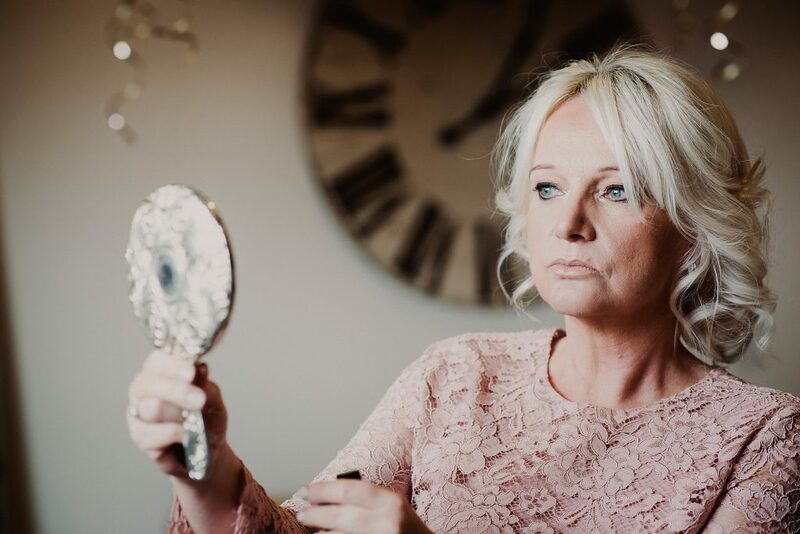 Mother-of-the-Bride, Wendy, opted for a gorgeous dusky pink lace dress and neutral makeup. Her brief was to make the most of her eyes with a heavier liner. When you’re wearing a hat getting the eyes to stand out through it’s shade is a good call. And as she’s comfortable in a neutral lip, we kept that as she normally would have. Wendy giving her Mother-of-the-Bride makeup the once over. So it was absolutely lovely to get such good feedback from the girls and Wendy. And even to be booked for Sara’s brother’s wedding at Moddershall Oaks for her sister-in-law to be, Nicky. It’s always great to catch up with brides, do their makeup again and be part of another great day in their lives. Thanks so much for having me ladies! And a big thank you to the venue. Wedding makeup at the Curradine Barns is something I always love being invited to do.